LIGHTWEAR introduces Headlights, sports caps that utilize fiber optic technology to make sports team logos flash at the crown. 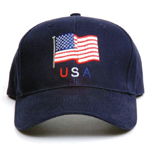 The licensed logos are meticulously reproduced and contain flashing lazer like points of light. The hats are of high quality fabric, and aside from the flashing lights, are virtually indistinguishable from other billed caps. They are lightweight and powered by a replaceable watch style battery. The hats have an adjustable Velcro closure, so one size fits all, and the team name is spelled out on the back of the hat. There's a handy, concealed on/off switch inside. The caps are weather resistant and can be worn safely indoors and out. Headlights are available for all NFL, MLB, NBA and NHL teams, dozens of NCAA teams, along with NASCAR, Miller Lite and Nextel Champion logos. There are also about a dozen different non sport designs, including a smile face, heart, Las Vegas sign, pumpkin, birthday, Santa, showman, skull, U.S. and Mexico flags, and the Red Hat Society. There is a 24 piece minimum opening order requirement. In a 24 piece order of assorted sports licensed units, the wholesale price is $13.90 each. On orders of 144 assorted sports logo caps, the wholesale price falls to $12.40 a unit. The suggested retail price is approximately $29.95. The wholesale price for an assortment of non sport Headlights is $12.90 a unit, and on orders of 144 units, the wholesale price drops to $11.40 a unit. A four unit display rack, which includes one a/c adaptor and wire assembly to light four, three volt caps, is $29.90. Batteries and a/c adaptors and wire assemblies are also available.